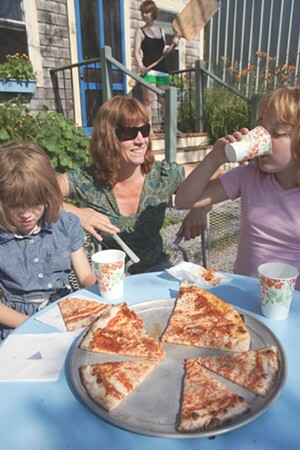 Out to Eat: Pizza on Earth | Out to Eat | Kids VT - small people, big ideas! I have never met a pizza I didn't like. It can be thick crust or thin, doughy or crisp, oozing with cheese or lightly topped. As long as it doesn't have mushrooms, I am happy. My kids — on the other hand — are more fickle pizza eaters. My two 10-year-olds don't like the sausage too spicy or the sauce too chunky, and they hate it when the crust is burned. Because they're so picky about their pie, I'm loath to try new pizza spots. But I was intrigued by a hand-painted wood sign at the bottom of a rural driveway on Hinesburg Road in Charlotte advertising "Pizza on Earth." I decided to take a chance and arranged for us to meet friends there on a recent summer night. As soon as we pulled into the gravel parking area surrounded by farm fields, I knew this was not going to be like any other pizza joint. In fact, Pizza on Earth is not a restaurant at all, but a wood-fired take-out place, where you can eat outside if the weather is nice. Four picnic tables accommodate diners, or you can bring your chairs or blankets for a picnic. Also bring your own drinks, salad and appetizers. Pizza on Earth supplies two things only: amazing pizza and desserts. The pizzas — plain cheese, pepperoni, garden veggie and two weekly specials — are all 12 inches wide and cost $15. My kids agreed to split a pepperoni pizza, and my husband and I ordered the specials: the Firecracker, with tomato sauce, scallions, garlic sausage, pepperoncinis and mozzarella; and the Red, White and Blue, topped with garlic oil, red onion, red pepper, blue cheese and mozzarella. As we sipped our wine and waited for the pizzas, our kids wandered into the farm field. They entertained themselves by climbing atop and walking along a long line of hay bales, making this possibly the easiest wait for a meal ever. The pizzas came quickly and, despite a few burned spots on the crust, the kids devoured them with nary a complaint. The crusts here are crunchy and thin, just sturdy enough to hold a smear of fresh tomato sauce and a light scattering of cheese and toppings. 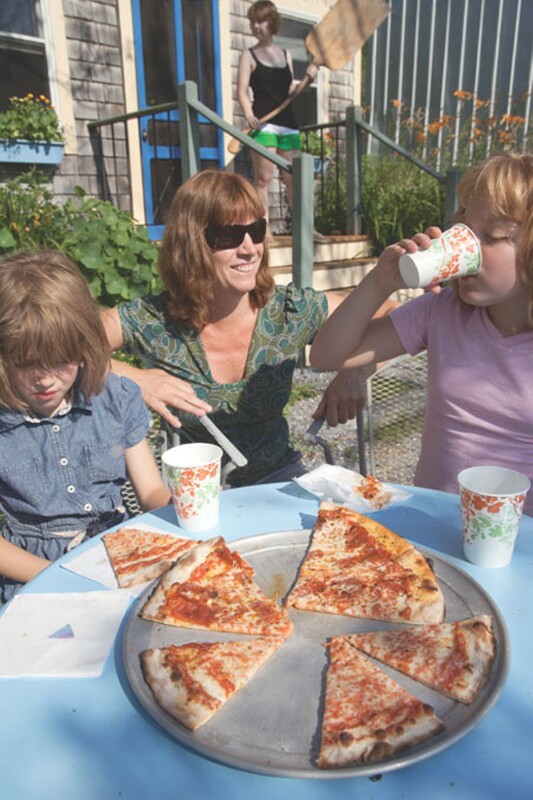 Pizza on Earth is about as farm to table as you can get, with homegrown veggies and herbs on every pie. Nothing about this pizza is heavy or greasy: I ate piece after delicious piece and still had room to sample two of the farm's homemade desserts: lemon tart and housemade gelato. Bellies happy and full, the kids did Mad Libs in the grass, and I sat back watching fluffy white clouds glide across the warm evening sky, wondering if this whole magical pizza dinner could be real. 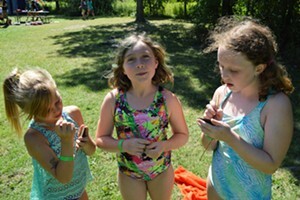 In fact it was a real, and only-in-Vermont, summer experience. Know Before You Go: Pizza on Earth is open Thursday and Friday from 4 to 7:30 p.m. They appreciate phone-in orders, and accept only cash and checks.